August sales of 3.96m tonnes were second-lowest in 14 months. Singapore marine fuel sales fell to their second-lowest level in 14 months in August, latest data released by the Maritime and Port Authority of Singapore (MPA) shows. With a monthly bunker volume of 3.96m tonnes, sales in August were down year-on-year (YoY) by 401,600 tonnes, or 9.2 percent. In a month-on-month comparison, the figure represents a fall of 73,800 tonnes, or 1.8 percent. It means that with two-thirds of 2018 gone, year-to-date (YTD) sales are 33.35m - and therefore down YoY in August for the first time since 2013. 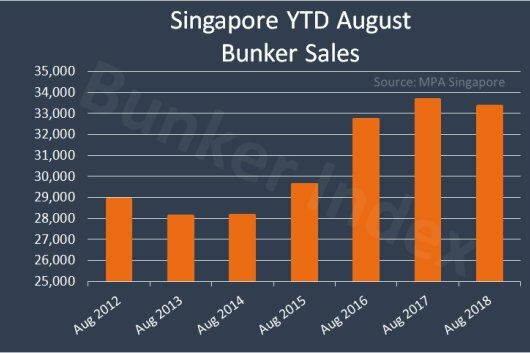 By this time last year, Singapore bunker sales had reached 33.68m tonnes; so this year's accumulated figure represents a 1.0 percent decline. 380 centistoke (cSt) sales plummeted YoY in August by 417,900 tonnes, or 12.9 percent, to 2,816.500 tonnes - the biggest YoY drop since September 2017 - and fell sequentially by 101,500 tonnes, or 3.5 percent. For 500 cSt, Singapore posted a volume of 876,600 tonnes, as sales decreased YoY by 15,600 tonnes, or 1.7 percent, but rose month-on-month (MoM) by 35,600 tonnes, or 4.2 percent. Sales of low-sulphur marine gas oil (LSMGO) were the most positive, jumping YoY by 16,100 tonnes, or 14.7 percent, to 125,700 tonnes. MoM, the rise was 25,500 tonnes, or 25.4 percent, as the 2020 global cap on fuel sulphur content draws closer. Standard MGO sales dropped YoY - for the second month in row - by 11,200 tonnes, or 18.5 percent, to 49,300 tonnes. Compared to July, volume dipped 1,000 tonnes, or 2.0 percent. The number of ships greater than 75 gross tonnes (gt) calling at Singapore for bunkers in August was 3,128 - representing a YoY decrease of 206, or 6.2 percent, and a MoM fall of 169, or 5.1 percent. The total number of vessels greater than 75 gt arriving in Singapore decreased YoY by 527, or 4.4 percent, to 11,389, whilst MoM, August's figure was down 216, or 1.9 percent.